Many of us who have gone searching for a new bicycle have experienced the same thing; we somehow know when we've found the right one. There's just something about being smitten by a particular bike, and, once that has happened to some of us, we simply must have it. 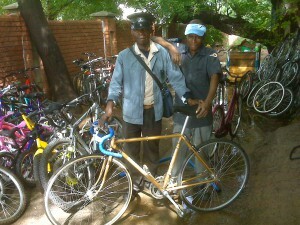 Rob Carle of Bicycle Recycle sent us a photo of one of the first customers at Jerry's Bikes in Gaborone, Botswana. We think he experienced this exact phenomenon. This old man was convinced that he needed a gold racing bike, despite our best efforts to convince him that a relaxed cruiser was the way to go. He liked the bike and wasn't leaving without it.